Note: This review-in-progress was largely conducted on the Xbox One, as PC code was unavailable until launch. I did, however, play for several hours on the PC last night to make sure everything worked and was stable. It seems to run just as smoothly as it did during the beta (a.k.a. very smoothly), but we’ll still be waiting to put a score on the game. I’ve largely come to terms with Star Wars Battlefront. Gone through the seven stages of grief and come out on the other side, so to speak. No, it’s not much at all like Battlefront II. No, it’s absolutely not what I wanted from Battlefront III. And no, it’s not really like Battlefield-with-a-Star-Wars-skin either. Well, it’s very pretty, for one. And it sounds great. Neither of those facts should surprise me at this point. It’s DICE, and this is what DICE does. Battlefield has always been (at least audio-visually) a technological marvel, and that talent makes it over intact to Battlefront. Whether you tromping through the glistening snow of Hoth or the sun-dappled redwoods of Endor, Battlefront looks and sounds like Star Wars, to an incredible degree. Red and green laser beams pew-pew through the air, delightfully old-school sparks erupting wherever they impact. AT-STs awkwardly shuffle back and forth, careening half-drunk around the battlefield. And perhaps most delightful of all is the stupid Wilhelm scream you’ll occasionally hear from a fallen foe. There’s a certain amount of camp that comes from digitally emulating practical effects from forty years ago, but it’s undeniably Star Wars. Slavishly so. Alien: Isolation is the only licensed game in recent memory with a similarly overt love for its source material. In many ways, Battlefront feels even more faithful to the look and feel of the original Star Wars trilogy than George Lucas’s green screen-heavy prequel films. 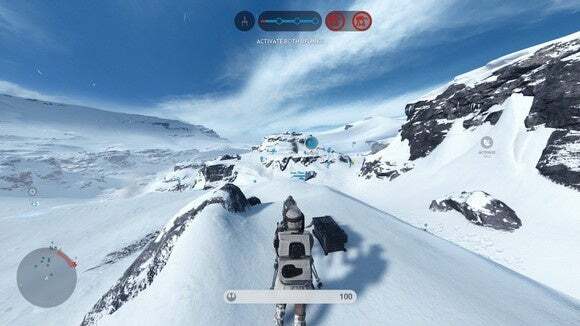 At its best, Battlefront is your lovingly-detailed toy box brought to life—Darth Vader and Return of the Jedi-era Luke Skywalker striding out into the middle of Hoth for a climactic engagement while Y-Wings strafe overhead and an Imperial Star Destroyer bombards the ground from its lofty perch in space. Those moments—therein lies the appeal. But it is surface-level sheen on a game that is surprisingly thin. Yes, there are a number of features from Battlefront II that have disappeared—space battles, Galactic Conquest, pilotable AT-ATs, and the list goes on. As I said, I’ve mostly come to terms with the fact this is a very different game from the original Battlefront III concept. 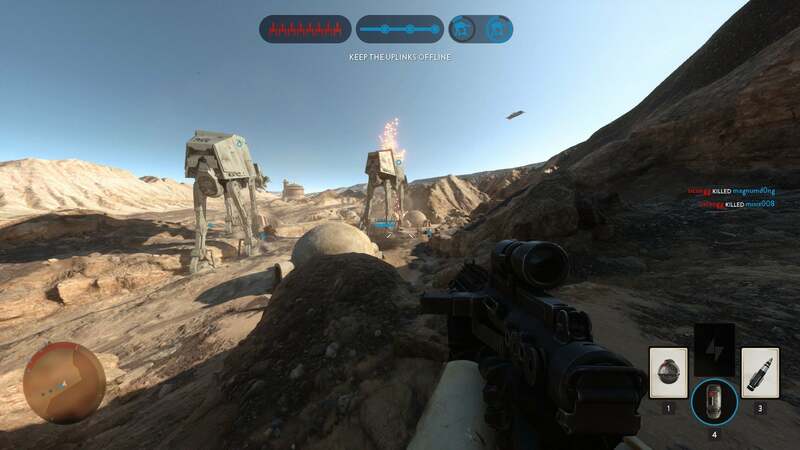 Battlefront feels thin even by modern standards, though. Only two modes feature large-scale conflict: The beta’s Walker Assault mode and a point-capture variant known as Supremacy. These allow for the full 20 versus 20 battles, vehicles, and hero units. There are four big-team maps. Four. These modes make for a decently fun break from Walker Assault/Supremacy—particularly Fighter Squadron—but they’re light on spectacle and none feels like something you’d sink an afternoon into. Especially since, as a shooter, Battlefront has some nasty issues. Most of the problems from the beta still exist: Awful spawns (especially on Hoth), grenade spam, overpowered one-shot weapons on extremely short cooldowns, et cetera. So you end up returning to the larger game types and...yeah. Four maps. They are beautiful maps. They are enormous maps. But there are four of them. You’ll see all of them in an hour. And with EA selling its usual $50 season pass with (I assume) more maps, the whole thing feels a bit cynical at best. And let’s go back to the fact the game is limited to twenty versus twenty even in its largest modes. DICE does a good job disguising this, mostly by clever use of sightlines and choke points. It’s easy to get sucked into ten-person battles and feel a sense of larger scale. Wander a bit and you’ll realize otherwise, though. These maps are, as I said, enormous—and yet so much is empty. Leave wherever the latest pitched battle is occurring and you’ll find there’s no one else around—nobody wanders the weird side corridors, no battle is taking place a hundred meters behind you, no enemies are hiding in that hangar you walked past. They’re all focused on the choke point, because DICE led them right to it. I suspect this is why there’s no Conquest mode. 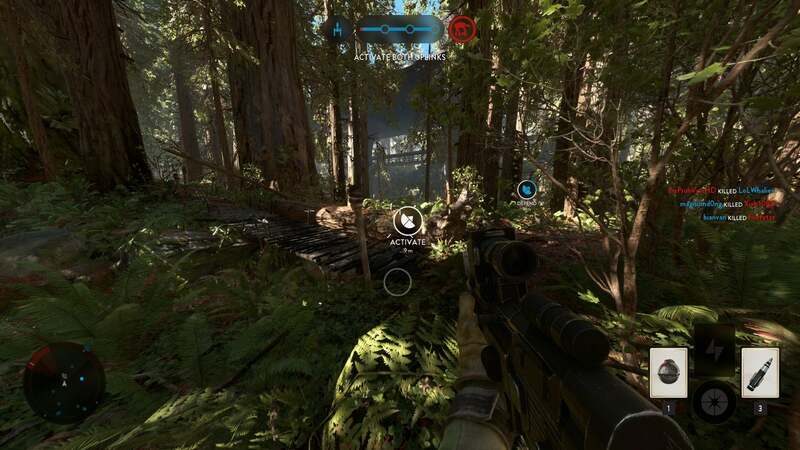 Instead, Battlefront features Supremacy—similar on the surface, but which plays out in a fundamentally different way. Conquest allows for freeform capture of a certain number of objectives. 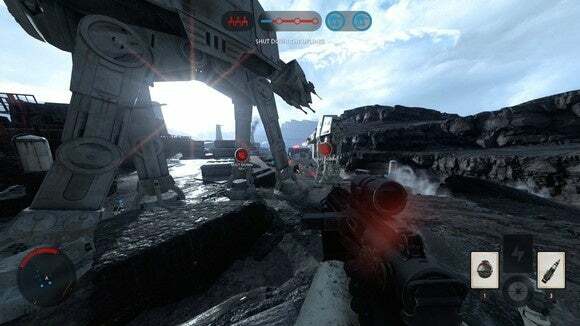 Battlefront’s Supremacy has five objectives, but at any given time your team is only trying to capture one and defend another, proceeding in a linear fashion. It keeps the battles tight. It keeps the battles centered around certain areas. It keeps you from wandering off into the woods of Endor and realizing that this is really a very small battle in a very large world. Honestly, it makes me wish DICE had borrowed from its EA cohort Respawn. I don’t think Titanfall’s bots were a great solution, but at least they fleshed out the action. In fact, Battlefront does this exact thing with Fighter Squadron—two-thirds of the ships are bots. But it didn’t apply the same principle to the ground. The result is that Battlefront 2015 Edition feels paradoxically both bigger and smaller than the decade-old Battlefront II. Sure, put the two next to each other and the difference in graphics is clear. I took that screenshot while writing this review, and everywhere you look there’s something happening. These are massive armies. Dumb armies full of dumb AI, in this case, but massive nevertheless. Battlefront 2015 feels empty, by comparison. The size of its maps often emphasizes how little is happening—it’s easy to end up in a “Run twenty seconds, die, start over” loop. A decade ago, Battlefront II’s sense of scale is what tricked me into feeling like I was living Star Wars. 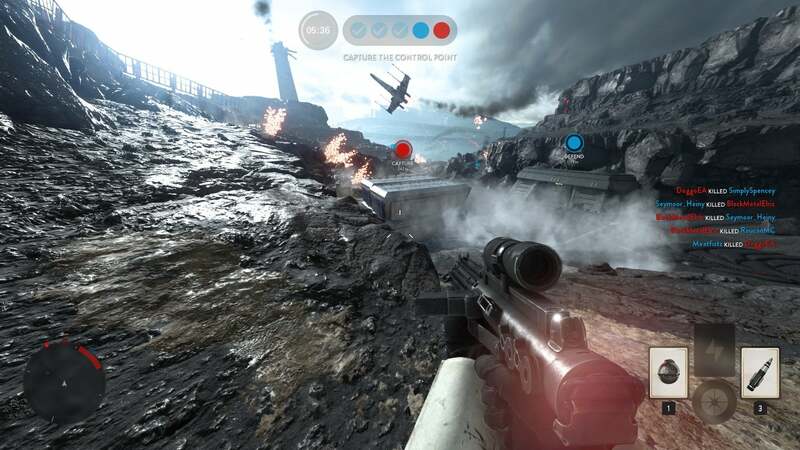 DICE gets pretty damn close to the same feeling with some damn spectacular graphics, but it’s not enough. Not for me, anyway. I’s definitely not where I expected we’d be in 2015. There are also two singleplayer/co-op modes. One is a reskinned Horde mode, fighting off waves of enemies. The other is...well, basically the same thing except the waves are just a stream of troops and you’re aiming to kill a certain amount. I don’t think either is very interesting, personally—though it will let you use all weapons immediately, no unlocks necessary. I played through each mode once and then went back to multiplayer. It is admittedly hard to divorce my opinions of Battlefront from my expectations—both in regards to the game’s predecessors and DICE’s other work. I’ve tried to avoid too many comparisons to Battlefront II here, but I’ve waited a decade for this game. 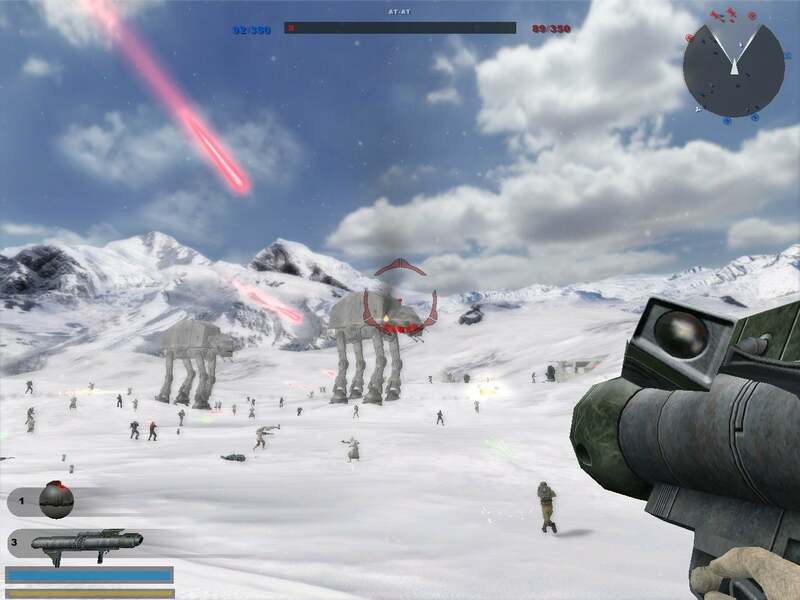 And after a decade this Battlefront is not only missing many of the modes and features that seemed destined for Pandemic’s original stab at a Battlefront III, but also much of what I liked about Battlefront II. I’ve also tried to avoid harping too much on “problems” that are endemic to the source material. For instance, I’m still not a fan of the fact guns in Battlefront have a spread instead of recoil. I don’t like the feel, and am certain it limits the skill ceiling. But hey—that’s what laser rifles (at least in Star Wars) do. DICE couldn’t change this even if they wanted to, and I’ve come to accept it for what it is. But I think the game falls into a weird place. It’s not Battlefront III enough for the Battlefront diehards. It’s not Battlefield enough for the Battlefield crowd. And it’s not deep enough (at least, not without spending another $50 and waiting on a months-long dribble of content) for me to believe the game has staying power—though it’s noob-friendly enough that it may (temporarily) appeal to the masses of Star Wars fans that have never touched its predecessor or a modern shooter, but want to pick up a fun video game after seeing The Force Awakens. We’ll see. If there’s one thing I’ve learned from Battlefield 4’s two-year-long rehabilitation, it’s never tell DICE the odds.